Amira Zeidan is a 24-year-old poor woman. She is married, and is living in a very poor community at Al-Baqa'a Village, Al-Tuhaita District in Al-Hudaidah Governorate. She had never acquired any life skills, had only 3 months of education in a literacy class opened by the Program in 2012. This class was discontinued due to the inability of the community to provide transportation to the facilitators. She said she had suffered much pain together with others for the cessation of classes. Her husband was illiterate and worked at sea during alwazef season – tiny fish thrown out of the sea- and collected and dried. He did not possess any other skill. Four years ago, she had a dream to become a mother; but due to illness, she did not realize this dream because she could not afford to continue receiving treatment due to family poverty. 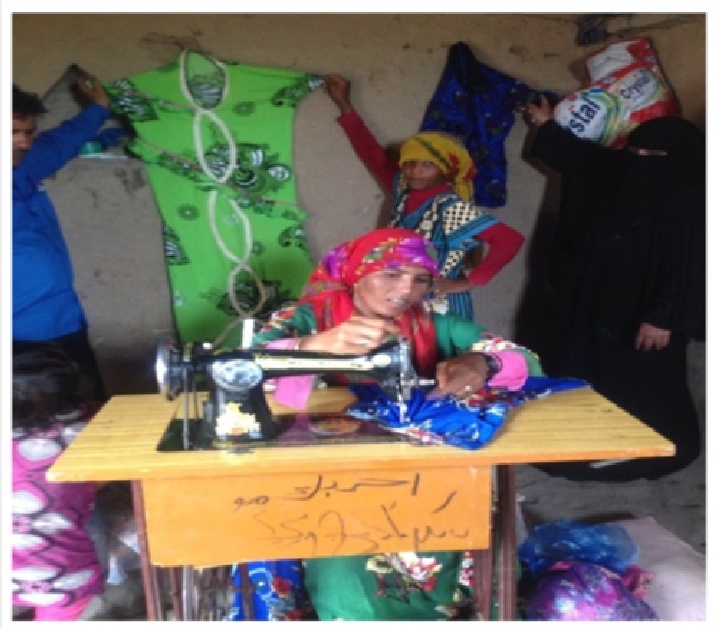 She says she had applied to the SFD consultant to get training in sewing instead of literacy classes, thanks to God she attended a 90-day training course organized by the Integrated Intervention Program. She practiced with her own garment until she succeeded in gaining the skill in addition to practical lessons provided. She says that she was provided with a sum of 23400 Riyals as the cost of transportation for attending the training and that this was the first sum of money she has ever received. This made her think again to realize her motherly dream, beside another dream to have her own sewing machine as her only source of livelihood in order to afford to buy her basic needs and continue receiving medical treatment. Why not, while she has acquired a new skill? She could not make a decision because the sum in her hand was not enough to purchase a sewing machine, and might not also allow her to have treatment. So, her dreams were in collision, but she determined to start with her new dream to own a sewing machine. She contacted the trainer living in Hodeida to purchase the machine for her for 19,000 Riyals. About 4400 Riyals remained. She worked with her machine for two months and sold her earrings and went for treatment. She says "now after 18 months, thanks to God, I will become a mother soon. I am earning a living from working on my machine. I also bought new earrings, and I start saving enough money to have an independent family home."